Many gardeners and landscapers make use of upright plants as ground covers or as fences in various garden designs. Interior designers even use houseplants to add glitter to interiors of many household. Landscape plants and houseplants do not just add beauty to many spaces; they also add in something more. According to Feng Shui experts, placing plants in the main entryway of one’s home can help in collecting pulling in positive energy. And in order to avoid barriers or clutters right at the front door of your homes, you must choose plants with upright growth and with high tolerance to neglect and adverse conditions. 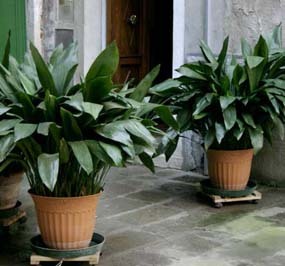 Aspidistra elatior, commonly known as the Cast Iron Plant, is top on the list of easy entryway plants. Although Cast Iron Plant is noted for its ability to withstand abuse and neglect, you must clean up its shade-loving evergreen foliage and put it in attractive pots or containers to preserve its entryway beauty. If your main entryway is facing the direction where there is full sunlight, make sure that your potted Cast Iron Plants enjoy little shade so it will not look ratty. Bring out the beauty of its cream-colored flowers by putting it in a tall pot or container that sits on a low-level spot or table. In addition to entryways, the Cast Iron Plant is also used in small scale ground cover for dense shade plantings, in indoor buildings such as shopping malls, in inner court yards, in indoor gardens, and as a shade patio container plant. can the aspidistra be divided if it is an old plant?